#3 Right in the middle of our universe are steps 101-to-103. | Walk the Planck! #3 Right in the middle of our universe are steps 101-to-103. Step 101: The diameter of typical human hair. 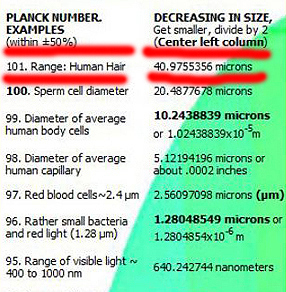 The range, from 17 to 181 microns, begins within step 100, includes all of 101 and goes into 102. There is something magical in these steps that are right in the middle of this universe. Life begins. Just how unusual is it? Possibly it is almost beyond belief. This scale of the universe is quite unusual. It gives life a special place. For each notation we simply look for things that are within its size range, a very definitive length. Keys Ideas: This has been a compelling educational experience. It gives a special importance to the nature of space. Human hair, the width of paper, and the female egg, within this scale of lengths, are all right in the middle of 13.78 billion light years. It is right in the middle of our human scale, essentially notations 67 to 137. Given the entire universe, from the smallest to the largest conceivable measurements, a few of the keys to human life are right in the middle. It gives one a reason to stop and think a little. Now, the next symbolic division of our universe would be division by three. Because those results stretched our imaginations, before looking at both as major transition points, it might be helpful to find our child within. Notes about Look-and-feel and Navigation: If any picture fails to be fully displayed (a very small thumbnail is), please refresh your browser. The full-size version should appear. If any of the letters from right column, the Archives and Meta are bleeding through the image of the Universe Table, please open your window larger (possibly to full screen). Usually if you click on the last sentence in each description you will go to the next page. Also, if you click here, you will go to the index for the tour and other pages of analysis. The universe divided in thirds: The old logic of the Small Scale, the Human Scale, and the Large Scale universe is in play, yet here the starting points are quite different than the historical use of those terms. Here the ranges for each are defined by simple math. The simple geometries. If the Planck Length is defined as a single vertex at notation 1, by step 65, it becomes a major structural enterprise. There are over 36 quintillion vertices with which to build an infrastructure for the physical world. The proton-fermion-electron appear to manifest at step 66. This small scale universe of geometry and numbers is unexplored within such a framework. Because it cannot be measured, it will be a science of basic logic and perhaps the very nature of a many-sided perfection and how things become imperfect. ← #2 If the Planck Length is the smallest, the largest length is the Observable Universe.